My company went to a new logo and tag line a little over 18 months ago. We got a note from corporate that they had a bunch of shirts with the old logo on them and they were free to whomever got a request in first. So we all filled out the sheet and sent it back. I couldn't get my first choice, a tan long sleeved shirt but I did get my second choice, a white long sleeved shirt. 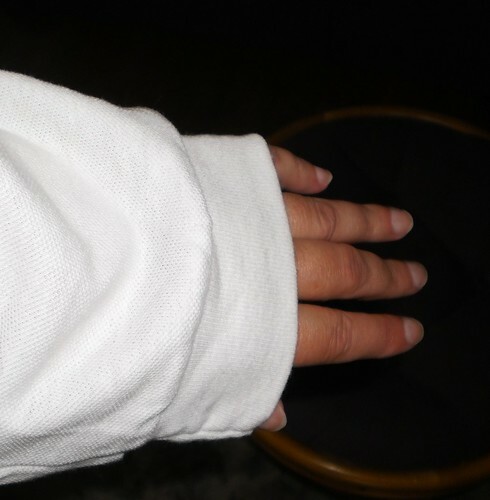 I put it on and here's the length of the sleeves. I don't get this. 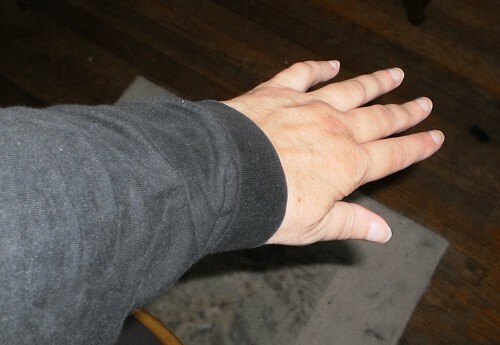 Granted, this is a men's XL size but look at the length of these sleeves. Are guys arms that much longer? It's a good 3 inches from where I want it to be, at my wrist. So, yesterday, I hauled out my XL Iowa Hawkeyes tee shirt to wear to work since they are playing Indiana today. Look at this length. This is a guy's shirt, too. It's just the right length. I'm not sure I quite understand the 3 inch difference between the two shirts. It's frustrating because the white shirt fits everywhere else but the sleeves make me feel like I should hunch over and walk on my knuckles. I'm wondering if I can just pin up the cuff to the length I like, sew it there and then cut off the excess. I've got a couple of other company shirts that also have sleeves too long for my taste. I have to shove them up to the elbow because they won't stay at the wrist and then they flop down and cover my hand at the exact wrong time. Maybe it's me. Maybe my arms are too short, proportionally. Maybe I need a couple hours on the rack.